However, I’m sending the trailer back to the trailer dealer so they can flash the whole underside of the trailer and paint it to keep the elements out from under my house as I drive and while stationary as well as give the spray foam something to spray to (subfloor OSB will be installed directly on top of the steel cross-members, maximizing my vertical interior height in my tiny house). Thanks for watching – what did you think of my video? Let me know in the comments below (a little shaky, I know… lol). You want to know what freedom feels like? As you may know from many of my posts on both my facebook profile and my facebook page, I’m going Tiny. You can read about why I’m embracing the Tiny House lifestyle in this previous blog post here, but the how is what’s beginning to take shape right now. I currently live in a 4 bed, 2 bath house in Huntsville, AL. It’s a great house I bought 8 years ago and added a custom extension to with a large covered deck, hot tub, etc. Of course, a lot has happened over the last 8 years and for most of my adult life my aim has been freedom (and more specifically, helping others achieve freedom in their life). I’ve set my life up in a way that allows me to travel a lot and see the sights, visit family, take courses and classes in other cities, set my own schedule and hours, etc. However, I was still a slave to the bank. Each month I still had to make a mortgage payment, and pay my required insurance premium, and real estate taxes, and utilities… even if I was somewhere else across the country skiing in the awesome Colorado powder, at the beautiful beaches on the gulf coast, or catching up with family in California I had still had make all those payments. All I have left is my bed and tv which I’m taking with me in my Tiny House. Everything else has gone. And it feels great!! I highly recommend it!! I’ll be honest the process of selling and disposing of my stuff at first seemed like it would be hard to do. After all I’ve had a lot of this stuff for 8 years – some things over 16 years from when I moved out of my parents house! There’s a lot of attachment to these things but knowing that my tiny house is going to have all the furniture built in and custom created, there’s just no space or need for any of these attachments (couches, side tables, lamps, dining table, armoire, dressers, etc). And that made it much easier to let go of a lot of this stuff because it just wouldn’t fit with the vision I had with my tiny house. And now that the stuff is gone, I feel so much lighter, free-er, liberated! Amazing how simply getting rid of stuff and creating space can make you feel so good! 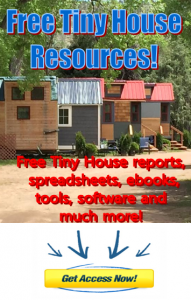 It puts me one step closer to living the ultimate freedom lifestyle in a Tiny House, a house that is super efficient, bright, smart (utilizing all the latest tech) and mobile so I can take my office, my house and my life with me wherever I go (thanks to my internet marketing business). Now when I travel I can still always be at home. Oh! Yes, it does. My black lab Claude can also now come with me wherever I go, instead of having to stay behind with a friend for most of my travels which is how’s it been up till now. Very excited. So stay tuned for further updates. I’ll be sharing pictures of the trailer my tiny house will be built on and the other steps in the process of going Tiny as I continue to pair down stuff from my house and being building my 2 bed, 2 bath tiny house. Talk to you then!